Chinese Premier Li Keqiang on Thursday called on China and the Czech Republic to create a just and fair environment for their respective enterprises doing business in each other's country. Li made the remarks during his meeting with Czech Prime Minister Andrej Babis, who is here to attend the eighth leaders' meeting of China and Central and Eastern European Countries (CEEC). Noting that this year marks the 70th anniversary of the establishment of diplomatic relations between China and the Czech Republic, Li said China is willing to enhance political mutual trust with the country, expand practical cooperation and strengthen people-to-people and cultural exchanges. 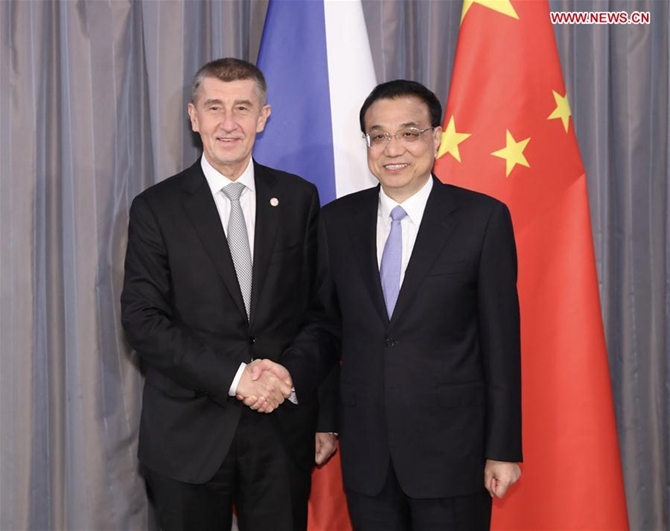 Bilateral practical cooperation enjoys a 70-year old tradition, noted the premier, saying that China supports competent Chinese enterprises to participate in infrastructure construction projects in the Czech Republic in compliance with rules and standards of the European Union. China is willing to work with the country to explore new cooperation patterns, make joint efforts to improve trade balance, and promote practical cooperation in industrial field and nuclear energy, among others, he said. China expects the Czech Republic to play a constructive role in promoting China-Europe cooperation, he added. For his part, Babis said the Czech-China relationship has seen a steady development, and his country welcomes more Chinese investment. He also called on the two sides to continuously promote practical cooperation in areas including energy and transportation infrastructure construction, and to enhance cultural and tourism cooperation as well as people-to-people exchanges. Babis said he is looking forward to a stronger Czech-China relationship under the China-CEEC cooperation framework so as to contribute to the development of China-Europe relations.